------------------------------------------------------------ ImgView.wlx V 1.0 2006-03-15 (C) M. Diegelmann ------------------------------------------------------------ 2006-01-19 First publication of ImgView beta release. 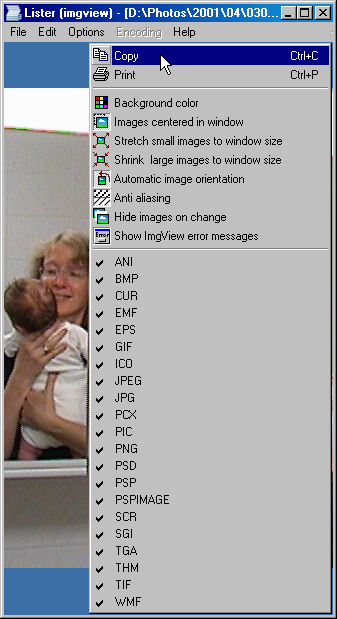 Supported image file types: BMP, EMF, ICO, JPG and WMF. 2006-03-15 Worst bugs eliminated. Supported image file types extended to: BMP, EMF, EPS, GIF, ICO, JPG, PCX, PIC, PNG, PSD, PSP, SCR, SGI, TGA, TIF and WMF. (Acknowledgements to Mike Lischke for providing the source code of his GraphicsEx library.) 2006-04-03 Printing of images implemented. 2006-06-16 Publication of ImgView on Christian Ghisler's official Total Commander 'Addons/Plugins' website. 2006-03... Language support extended to English, German, French, Italian, Spanish, Danish, Swedish, Dutch. (Acknowledgements to Gabi Müller, Stefano Bertolucci, Anitzia Solis-Fuentes, Ola Montan, Pieter Hoogenboom, Paul van der Heyden, and Elmar Junker.) 2006-11-15 Printer bug fixed. (Crashed if no printer is installed.) 2006-12-29 Workaround for INI file bug. (Crashed if TC had been installed to the 'Program Files' directory and if the user didn't have administrative rights.) 2006-12-29 Workaround for TIF bug. (Crashed with some TIF format versions.) Support of TIF files compress- ed with 'CCIT Group 4 Fax' will be postponed to a later version of ImgView. 2007-01-11 Bilingual error messages problem fixed. 2007-01-11 Image files which are in use by another process are now still accessible to ImgView (however, at the expense of the possible occurrence of an exception if such a file is modified while being read by ImgView). 2007-01-11 INI file workaround (see 2006-12-29) replaced by saving this file to the user specific APPDATA path if available. This feature will become absolutely essential with the Windows Vista operating system. 2007-01-18 If the Windows XP style is selected the checked/ unchecked state of menu items with glyphs is not visibly discernible as it is when using the Windows classic style (which I do). Bug fixed by replacing these nice little glyphs by the good old check mark in case the Windows XP style is detected. (Sorry but that's penalty you will have to pay for using this silly candy style XP look!) 2007-01-18 Display of ImgView error messages made optional. ("Show ImgView error messages" menu item added.) 2007-08-10 Support of THM image file type added. (In reality these THM thumbnail files created by Canon cameras for each AVI videoclip are nothing else but ordinary JPG image files.) 2007-08-11 Support of CUR (cursors) and ANI (animated cursors) image file types added. (Display of animated cursors will only be static.) 2007-08-15 Support of JPEG image file type added. JPEG (being just an alias for JPG) and JPG both use the same encoding. 2007-09-15 Option for automatic image orientation added (according to the "orientation" tag in the Exif meta data). 2008-03-04 EMF and WMF images are now copied to the clip- board in two formats: as a vector graphic (as before) and as a bitmap (new feature). ------------------------------------------------------------ ImgView.wlx V 2.0 2009-01-10 (C) M. Diegelmann ------------------------------------------------------------ 2009-01-10 GIF support extended to animated GIF (using Anders Melander's GifImage library, adapted to Borland Delphi 7 and currently maintained by Finn Tolderlund). 2009-01-10 Faster JPEG loading using the Intel JPEG Lib- rary IJL15.dll. 2009-01-18 Support of PSPIMAGE image file type extension added. PSPIMAGE (being just an alias for PSP) and PSP both use the same encoding. 2009-11-26 Optional anti aliasing added.